Original Hedgerow - Legs 1 and 2. Sun early, then cloudy but dry. Another Psathyrella growing on dead wood in the bottom of a dry! ditch. Cap about 7 cm across. Probably Psathyrella candolleana. Two shots of the Common Dog Violet - Viola riviniana. This is three days earlier than last year. Bog Violet is next on the list, but not for a few weeks, yet. Another blow-fly. This one is a dramatic copper colour all over. It reflects the Dandelion yellow well. About 12 mm long. On Wednesday I showed the purple centres to some of the Celandine leaves. I now notice that some emerging leaves of the Meadow Buttercup (a closely related species) have purple centres, too. More emergers: Meadow Vetchling - Lathyrus pratensis - on a wall, with a Stonecrop, and Alder leaves on the right. Butterbur - Petasites hybridus - has opened on a few verges. It's closely related to Winter Heliotrope, which is just dying away, now. I spotted this beautiful filmy moss on the back wall of a ditch. 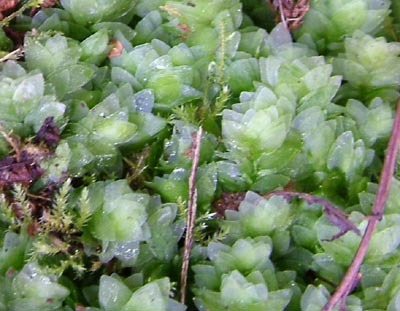 Hookeria lucens.